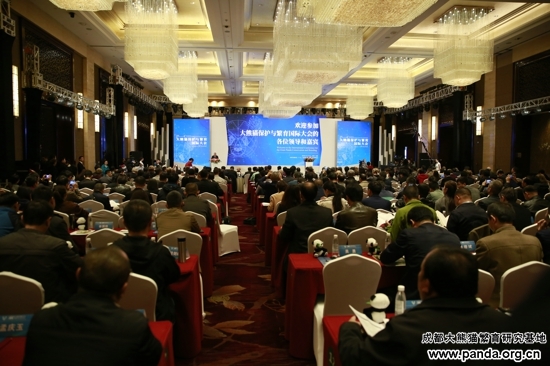 From November 7 to November 11, 2018, the International Conference of Giant Panda Protection and Breeding & 2018 Annual Conference of Breeding Techniques Committee for Giant Pandas were held in Chengdu, Sichuan Province. At 9:00 a.m. on the 8th, the conference officially launched. 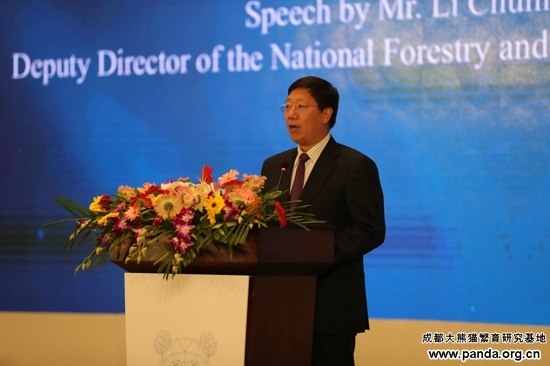 Li Chunliang, Deputy Director of the National Forestry and Grassland Administration (National Park Administration), delivered an opening speech; Yang Xingping, Vice Governor of the Sichuan Provincial People’s Government; Xue Jianxing, Deputy Governor of the Shanxi Provincial People’s Government; Yang Longjun, Deputy Secretary-General of the Gansu Provincial People’s Government; and Marja Kokkonen, representative of the Ministry of Agriculture & Forestry, Finland, presented at the opening ceremony and made remarks. A total of over 400 representatives from the Embassy and Consulate General of the United States, the Republic of Austria, the Netherlands, and many other countries; forestry administrative departments and conservation areas of Sichuan, Shanxi, and Gansu provinces; giant panda feeding and breeding units at home and abroad; colleges, universities, scientific research institutes, industry associations, and international organizations also attended the opening ceremony. 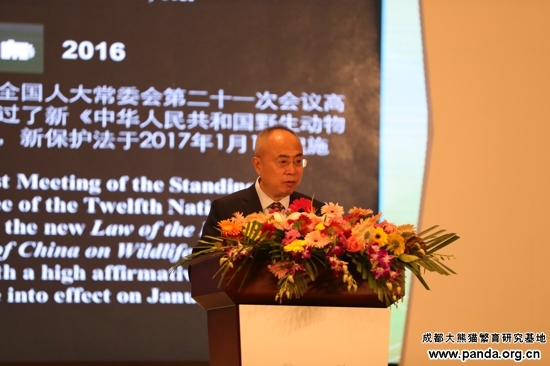 In Li Chunliang’s speech, he said, the giant panda is a “Living Fossil” and “national treasure of China”, and that strengthening giant panda protections is a significant step to maintaining biodiversity and balancing the ecosystem. Today, we solemnly hold the International Conference of Giant Panda Protection and Breeding & 2018 Annual Conference of Breeding Techniques Committee for Giant Pandas with the aim of sharing the achievements of giant panda protection in China, building an international exchange platform to protect them, and raise the level of conservation, management and international cooperative research surrounding them. The giant panda is the common precious natural heritage of mankind, and we still have to face many difficulties and challenges in the protection of giant pandas. I sincerely hope that everyone can offer advice and suggestions, unite in a concerted effort to extract more wisdom and strength to protect giant pandas well and make new and greater contributions towards the protection of global endangered species conservation and ecological construction. On an unprecedented scale, more than 400 Chinese and foreign experts gave their advice and suggestions. The International Conference of Giant Panda Protection and Breeding this year, for the first time, jointly hosted by the National Forestry and Grassland Administration (National Park Administration), Sichuan Provincial People’s Government, Gansu Provincial People’s Government, and Shanxi Provincial People’s Government; co-organized by the Forestry Department of Sichuan Province, Forestry Department of Shanxi Province, Forestry and Grassland Administration of Gansu Province, Chengdu Forestry and Park Administration, Chengdu Giant Panda Breeding Research Foundation; and undertaken by the Chinese Association of Zoological Gardens, China Wildlife Conservation Association, Chengdu Research Base of Giant Panda Breeding, and China Conservation and Research Center for the Giant Panda, is an international conference of unprecedented scale and might and has caught the gazes of leaders from relevant departments at the national, provincial, and municipal levels. Representatives from the National Zoological Park of the United States, Zoologischer Garten Berlin, and other 14 international cooperation units of giant panda breeding; representatives from the United Nations Development Programme, World Wildlife Fund, and other 8 international organizations; representatives from Hong Kong and Macao; experts and scholars from nearly 20 universities and scientific research institutions, including Peking University, Zhejiang University, Beijing Normal University, and more; professionals from more than 20 giant panda reserves in Wolong of Sichuan, Foping of Shanxi, Baishuijiang of Gansu; and more than 400 representatives from more than 30 domestic zoos, including the Beijing Zoo, Shanghai Wildlife Park, and Guangdong Chimelong Group, attended the conference. 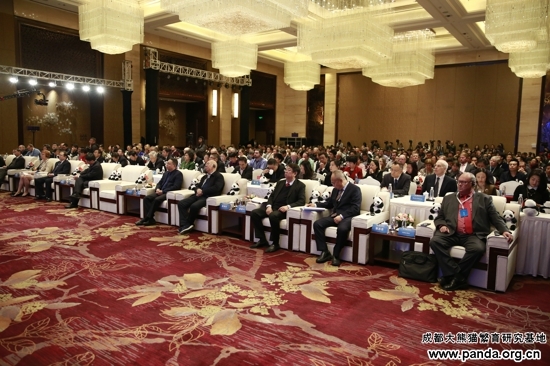 The conference conducted in-depth discussions and exchanges on local conservation and wild release, feeding and breeding, nutrition and behavior, disease prevention and control, community development, public education, and other topics related to giant pandas. Xia Xianzhu, Scholar of the Military Veterinary Research Institute of the Academy of Military Sciences PLA China; Wei Fuwen, Scholar of the Institute of Zoology of the Chinese Academy of Sciences; David Wildt, conservation biologist at the National Zoological Park of the United States; and other top giant panda experts at home and abroad shared their academic achievements at the meeting. The National Forestry and Grassland Administration released the latest data on giant pandas. At the conference, Li Chunliang, Deputy Director of the National Forestry and Grassland Administration, released the latest data on giant pandas for the first time. As of November 2018, the number of giant pandas in captivity has hit a record high again, reaching 548 worldwide. In 2018, a total of 48 giant panda cubs out of 36 litters were born, with 45 surviving, a survival rate of 93.75%. Among the 45 giant pandas, 31 were bred and are surviving in the China Research and Protection Center for Giant Pandas, including one living in Malaysia; 11 in the Chengdu Research Base of Giant Panda, including 1 living in Japan; and 3 in Beijing Zoo. All these surviving cubs have formed a healthy, dynamic, and sustainable giant panda population. At present, China has carried out cooperative research projects on the protection of giant pandas with 22 zoos in 17 countries, and 58 pandas live abroad for international cooperative research projects. Giant pandas not only set up an important bridge for international friendly exchanges, but also bring together the world’s conservation workers, becoming a model for global conservation of an endangered species. This year, releasing the giant pandas bred in captivity into the wild has continued; since the launch of the release work in 2003, the number of giant pandas bred in captivity released into wild will be up to 10. The National Forestry and Grassland Administration summarized the giant panda protection and breeding work in recent years, and deployed the focus of work for the next stage. 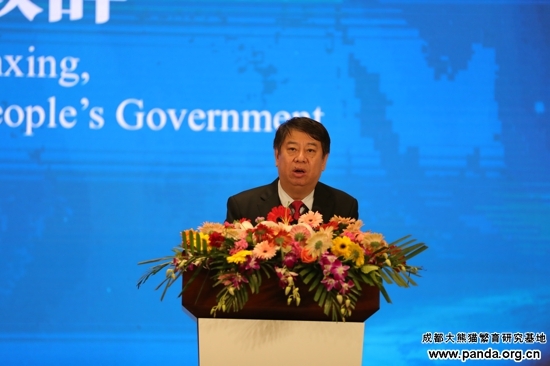 At the conference, Zhang Zhizhong, Deputy Director-General of the Wildlife Protection Department of the National Forestry and Grassland Administration, summarized the giant panda protection and breeding efforts in recent years, and deployed the focus of work for the next stage. First, he insisted on taking concrete measures to strengthen habitat protection, seriously implement major ecological projects, and focus on solving the problems causing giant panda habitat fragmentation and gene isolation. Second, he insisted on leaving nothing back for the pilot project of the national park system, actively draw on advanced international experience, consciously organize and carry out pilot projects of the giant panda national park system, and comprehensively improve the level of panda protection and management. Third, he stated the need to promote standardized implementation of release into wild work, plan and build training grounds for releases, encourage exploration and study in various forms for release, release methods, and release areas to find the most optimal way to release and replenish the wild population. 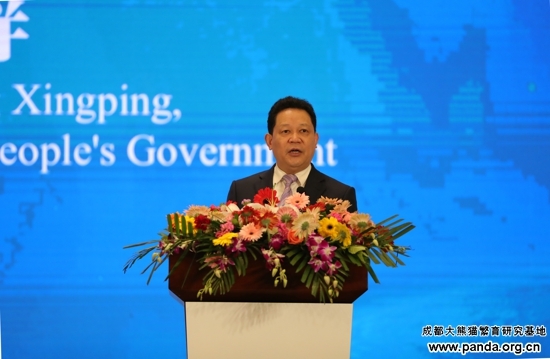 Fourth, he emphasized striving to improve the level of scientific research and strengthen the construction of scientific and technological talent teams, conduct in-depth scientific research on giant pandas, and promote the establishment of international cooperative research and exchange platforms. Fifth, he emphasized strengthening gene exchange among populations and apply system mechanisms and administrative methods to strengthen good births and breeding of captive populations as well as gene exchange among individuals of a population, and encourage scientific research and exploration to seek exchanges with wild individuals. Sixth, he requested we pay more attention to public concern for the protection of giant pandas, and correctly guide public opinion and standardize and strengthen the management of panda borrowing activities in China, highlight the purpose of public education for such activities, and establish a supervision and inspection system for such work. 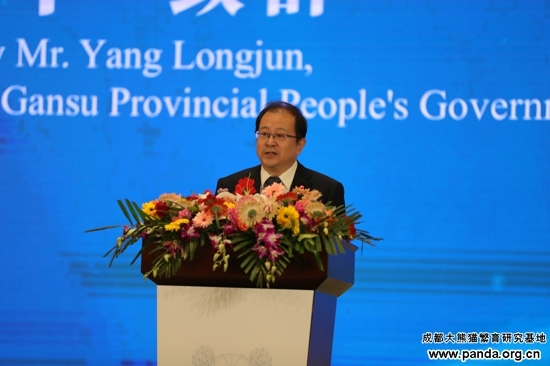 Seventh, he said to encourage and support multi-form activities to show and explore the cultural and artistic connotations of giant pandas, expand the connotation of the protection of giant pandas, and promote and enhance the unique role of giant panda protection in advancing ecological civilization. The National Forestry and Grassland Administration disclosed the pilot program of the giant panda national park system. 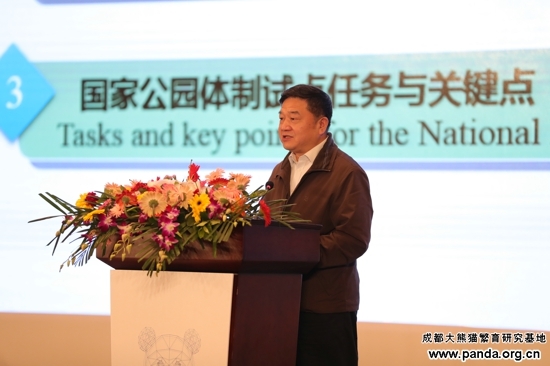 At the conference, Tang Xiaoping, Deputy Director of the National Park Management Office, made a progress report on the pilot project of the giant panda national park system. The Giant Panda National Park covers an area of 27,000 square kilometers and has integrated more than 80 various nature reserves and numerous state-owned forestry bureaus (fields) including the primary panda habitats, gene exchange corridors, and some potential habitats in Sichuan, Shanxi, and Gansu provinces. It is a great responsibility given by the central government to explore new protection mechanisms for rare wildlife in Sichuan, Shanxi, and Gansu provinces, as well as the base of the new model of giant panda protection. At present, the Pilot Implementation Plan for the Giant Panda National Park System has been compiled and issued, in which the focus, approaches, timetable, and responsible units have been confirmed. It establishes a unified protection management organization and comprehensive law enforcement team and contains the completed first draft of the Master Plan for Giant Panda National Park. It also organizes and carries out relevant special plans and special studies. 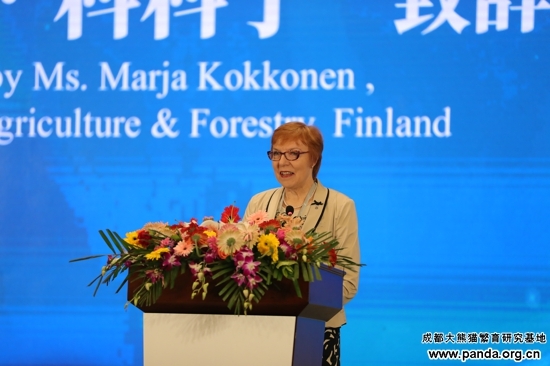 At the same time, it strives to increase investment and strengthen resource protection, cooperation, and exchanges. According to the plan, by the end of 2020, the ecological links between previously isolated habitats will be unblocked, the integrity and authenticity of the regional natural ecosystems will be significantly improved, and the most stringent system of protection will be applied to the ecosystems that are included in the zone. 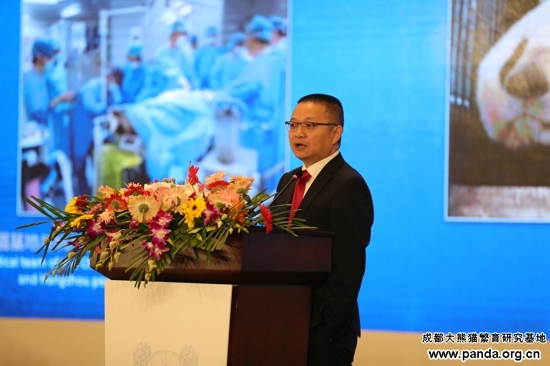 At the conference, Zhang Zhihe, doctor, researcher, Director of Chinese Committee of Breeding Techniques for Giant Pandas and Director of Chengdu Research Base of Giant Panda Breeding, made the f 2018 Annual Conference of Chinese Committee of Breeding Techniques for Giant Pandas Report. It summarizes the work and achievements of the Committee in 2018, provides planning and direction for work in 2019 as well. Furthermore, the report stresses that, at present, as the population of giant pandas in captivity grows rapidly, all units that manages giant pandas shall take appropriate measures to expand the population of giant pandas in captivity on the condition that the health and safety of giant pandas are guaranteed. We shall also, under the guidance of scientific direction, establish and improve the technical system of wild training and release of giant pandas to ensure the steady development of the cause of giant panda protection.